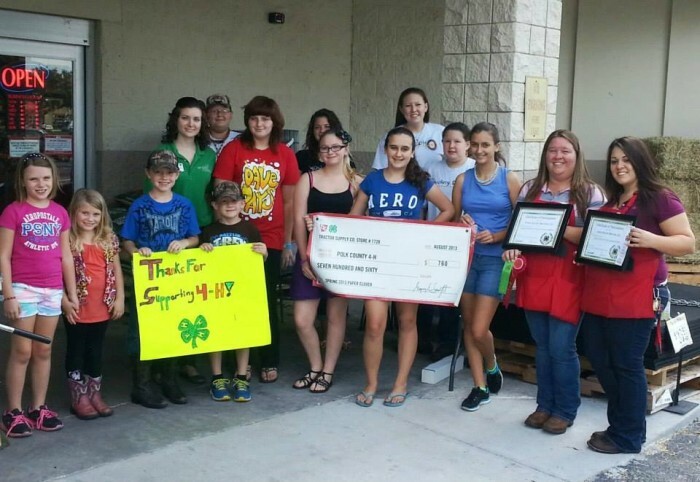 The Bartow Tractor Supply Company (TSC) store was recently recognized for winning the “Class Champion” award for meeting the company’s goals during the 4-H/TSC Spring 2014 Paper Clover Promotion. Store employees at the Bartow TSC store had at least 20% of all transactions include a 4-H Paper Clover purchase and raised over $300 for 4-H. They will be presented with a certificate and ribbon from Polk County 4-H to recognize this achievement. The 4-H/TSC Paper Clover Campaign is a nationwide, in-store fundraiser that benefits 4-H programming in the communities where a TSC store is located. Collectively, the fall campaign raised over $750,000 that supports 4-H on the local, state, and national level. During the twelve day promotion, the Bartow, Haines City, Lakeland, and Lake Wales TSC stores participated in the fundraising campaign. The effort has provided direct support for local camps, after-school programs and other activities, and has granted scholarships to these events that youth can explore their interests in everything from animal science to robotics. In Polk County, the Paper Clover funds have gone to support programming for 4-H clubs and volunteer development.